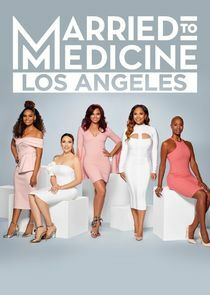 Married to Medicine Los Angeles gives viewers a look into the elite and fast paced lives of five successful women, including doctors and doctor's wives living in Los Angeles. With an incredibly small and exclusive African American medical community to lean on, these women share a special bond. However, when circles are this tight, it's only a matter of time before paths and personalities collide. From juggling bustling careers and family life, to shifting rivalries and evolving friendships, one thing remains constant... They are all married to medicine.